A laboratory analysis was conducted at the Archaeometry Laboratory of Ε.Κ.Ε.Φ.Ε. “Dimokritos” on 120 samples of artefacts. The multitude of bronze grave goods in the shaft graves, the tholos and chamber tombs in the area of Pylos, from the end of the Middle Helladic, down to the LH IIIA period, indicates the increasing importance of metals, especially bronze, in all aspects of local social activities. The latter suggests that the development of the alloys and the technological methods of manufacture of bronze artefacts could represent an indication of social transformation, which took place during the same period, since the availability and the quality of raw materials are directly related to the social position of the owners of the final products. Aiming at the discovery of these developments, a laboratory analysis was conducted at the Archaeometry Laboratory of Ε.Κ.Ε.Φ.Ε. “Dimokritos”, with modern analytical techniques, on 120 samples of artefacts belonging to grave groups from Peristeria, Volimidia, Routsi, Tragana and other smaller sites, dating from the period between the end of the Middle Helladic, down to and including LH IIIA. 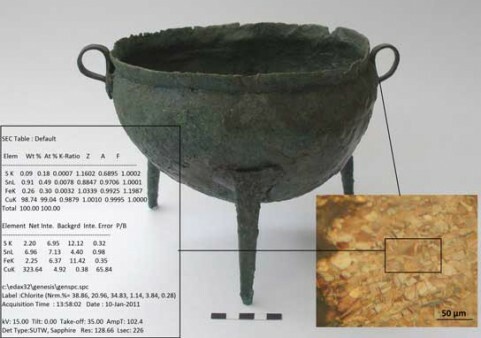 According to the analytical and statistical data, the availability of the raw materials, especially tin, as well as the quality of copper as raw material, in the early Mycenaean period, are both directly related to the ability of certain groups to own objects and raw materials with high specifications. During the LH IIIA period a change was detected in the data, and an increase in the availability of high quality raw materials to a wider spectrum of the population, a fact, which is possibly related albeit indirectly, to the establishment of the palatial centre on the Eglianos hill and the conditions of political and social stability it imposed. Where and when: Ioannis Drakopoulos Amphitheatre (Central building of the University of Athens, Panepistimiou 30), Wednesday, May 22, 2013, 7.00 p.m.